Astronomers have long known that many surveys of distant galaxies miss 90% of their targets, but they didn’t know why. Now, astronomers have determined that a large fraction of galaxies whose light took 10 billion years to reach us have gone undiscovered. This was found with an extremely deep survey using two of the four giant 8.2-meter telescopes that make up ESO’s Very Large Telescope (VLT) and a unique custom-built filter. The survey also helped uncover some of the faintest galaxies ever found at this early stage of the Universe. Astronomers frequently use the strong, characteristic “fingerprint” of light emitted by hydrogen known as the Lyman-alpha line, to probe the amount of stars formed in the very distant Universe Yet there have long been suspicions that many distant galaxies go unnoticed in these surveys. A new VLT survey demonstrates for the first time that this is exactly what is happening. Most of the Lyman-alpha light is trapped within the galaxy that emits it, and 90% of galaxies do not show up in Lyman-alpha surveys. To figure out how much of the total luminosity was missed, Hayes and his team used the FORS camera at the VLT and a custom-built narrowband filter to measure this Lyman-alpha light, following the methodology of standard Lyman-alpha surveys. Then, using the new HAWK-I camera, attached to another VLT Unit Telescope, they surveyed the same area of space for light emitted at a different wavelength, also by glowing hydrogen, and known as the H-alpha line. 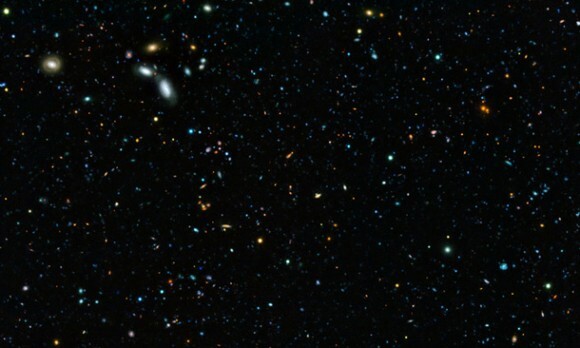 They specifically looked at galaxies whose light has been traveling for 10 billion years (redshift 2.2), in a well-studied area of the sky, known as the GOODS-South field. “This is the first time we have observed a patch of the sky so deeply in light coming from hydrogen at these two very specific wavelengths, and this proved crucial,” said team member Goran Ostlin. The survey was extremely deep, and uncovered some of the faintest galaxies known at this early epoch in the life of the Universe. The astronomers could thereby conclude that traditional surveys done using Lyman-alpha only see a tiny part of the total light that is produced, since most of the Lyman-alpha photons are destroyed by interaction with the interstellar clouds of gas and dust. This effect is dramatically more significant for Lyman-alpha than for H-alpha light. As a result, many galaxies, a proportion as high as 90%, go unseen by these surveys. “If there are ten galaxies seen, there could be a hundred there,” Hayes said. Different observational methods, targeting the light emitted at different wavelengths, will always lead to a view of the Universe that is only partially complete. The results of this survey issue a stark warning for cosmologists, as the strong Lyman-alpha signature becomes increasingly relied upon in examining the very first galaxies to form in the history of the Universe. “Now that we know how much light we’ve been missing, we can start to create far more accurate representations of the cosmos, understanding better how quickly stars have formed at different times in the life of the Universe,” said co-author Miguel Mas-Hesse. The breakthrough was made possible thanks to the unique camera used. HAWK-I, which saw first light in 2007, is a state-of-the-art instrument. “There are only a few other cameras with a wider field of view than HAWK-I, and they are on telescopes less than half the size of the VLT. So only VLT/HAWK-I, really, is capable of efficiently finding galaxies this faint at these distances,” said team member Daniel Schaerer. Suivant ›Des astronomes ont trouvé 90% de plus d’Univers!